What do we know about the mental health of inmates? What are the implications of what we know? Nathaniel J. Pallone characterizes opinion on these questions as falling into two broad camps: the "tender-hearted," those who see an overlap between mental illness and criminal behaviour, and are treatment-oriented; and the "tough-minded," those who have little confidence in psychiatric categories, do not really accept arguments about diminished responsibility, and who feel the emphasis should be on punishment. Which is closer to the truth? 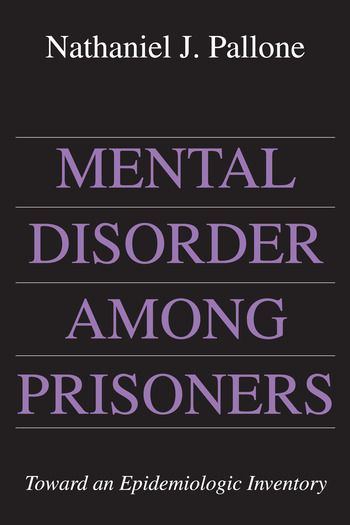 When this book was first published, the incidence of mental disorder among prisoners was nearly four times greater than among comparable groups in the general population in part because prisoners are disproportionately drawn from demographic groups with a high incidence of mental disorder—non-white and from lower socioeconomic strata. But other data is equally dismaying: mental retardation is 50 percent higher; alcohol and drug abuse is between five and eight times greater; and neurogenic disorders may be 1,700 times greater. In all categories of mental illness, the incidence among prisoners is far higher than among the general population. Pallone asserts that evidence suggests that the design and implementation of mental health care needs serious revaluation, particularly in view of Supreme Court decisions mandating mental health care despite obstacles with implementation. Palone saw mental health care as the primary issue for those who manage prisons. Sadly, this remains as true as when this book was first published. The Right to "Treatment" and to "Care"